Joseph Parry was born in Georgetown, Merthyr Tydfil, when the town was still at the heart of the industrial revolution. At the age of nine he became a pit-boy and at twelve an iron-worker, but he lived at the centre of a musical environment, singing in Rosser Beynon’s choir. His family emigrated to Danville, Pennsylvania, in 1854. He worked in the rolling mills there and studied music with other Welsh emigrés. His success as a composer in local eisteddfodau and, later, with pieces he submitted by post to the National Eisteddfod in Wales led the Welsh communities in North America to establish a fund to allow him to spend three years studying at the Royal Academy of Music in London, where he won the top medal for composition. He returned to Danville to run his own music college but in 1874 accepted an invitation to become the first Professor of Music at the recently opened University College of Wales, Aberystwyth. Disagreements with the College Council in Aberystwyth led him to resign in 1881 and move to Swansea to take up the post of organist at Ebenezer Chapel and to set up his own music college. Seven years later he took up the post of Lecturer in Music at what was then the University College of South Wales and Monmouthshire but has now become Cardiff University; a post which he continued to hold until his death. He is buried in the churchyard to St Augustine’s in Penarth, where he lived during his final years. During his lifetime, his reputation was unassailable; he had charm, charisma, was an inspiring and gifted teacher and a complete all-round musician. He was very much a man of his age: a sincere Christian, a staunch teetotaller and a family man given, perhaps, to a certain degree of self-importance. His more ambitious works, such as the first Welsh opera, Blodwen (1878) and his oratorios, Emmanuel (1880) and Saul (1892) were products of their age. His name though is immortalised in the great Welsh hymn-tune Aberystwyth and, perhaps, the greatest of all Welsh part-songs, Myfanwy, which effortlessly evokes the Wales of the mining valleys, the non-conformist chapels and its great male voice tradition. Joseph Parry's manuscripts are held at the National Library of Wales. Please visit the database of their collection here. 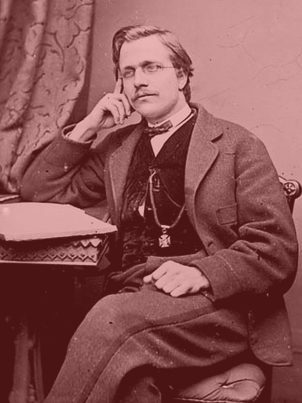 Mae llawysgrifau Joseph Parry o fewn casgliad Llyfrgell Genedlaethol Cymru. Ewch i chwilio'u bas data yma. Appearing to date from the period when he was Professor of Music at the University College, Aberystwyth, this piece seems to have originally been written with the title of Recollections of the Fireside, with the word ‘Reverie’ as a subtitle. 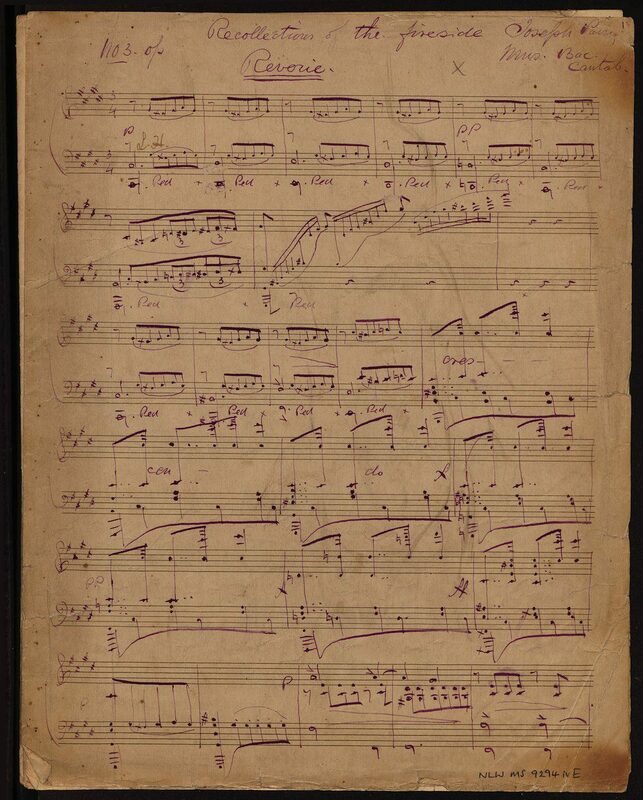 Following this, in the National Library’s collection of manuscripts, is another thematically connected piano piece which is titledRecollections of Spring, although ‘of Spring’ appears to have been later crossed out. They were probably meant to be as a set of pieces (two or more) written not long after achieving his Mus. Doc. (Cantab.) degree which he gained in 1878. However, an identical piece of music surfaces later as a stand-alone piece in a copy entitled ‘A Seaside Reverie’. It is at times, delicate and grand, with flowing dream-like arpeggi and sometimes almost orchestral textures. This brief piece of four short movements was composed for Parry’s friend, Kitty Wanes (maybe a student) while he was a lecturer in music at University College, Cardiff. Amongst other familiar Welsh tunes, it features the melody from ‘Toriad y Dydd’ in the second movement, ‘Lament’. [This tune is also known as ‘Taliesin’s Prophecy’ in English and tells of Taliesin’s sixth-century prediction referring to the ancient Britons: ‘Their God they shall worship, their language they shall retain, their land they shall lose except wild Wales’.] It is composed in a classical-romantic style and would have been a fine piece for a student to perform in a recital, as it was most likely intended. Y Santes Dwynwen (The Saint Dwynwen) is the Welsh Patron Saint of Lovers. 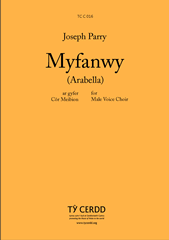 Parry’s piece is for Male voices with words by the poet Gwynionydd (Benjamin Williams) and was used as a test piece in the 1896 Llandudno National Eisteddfod. 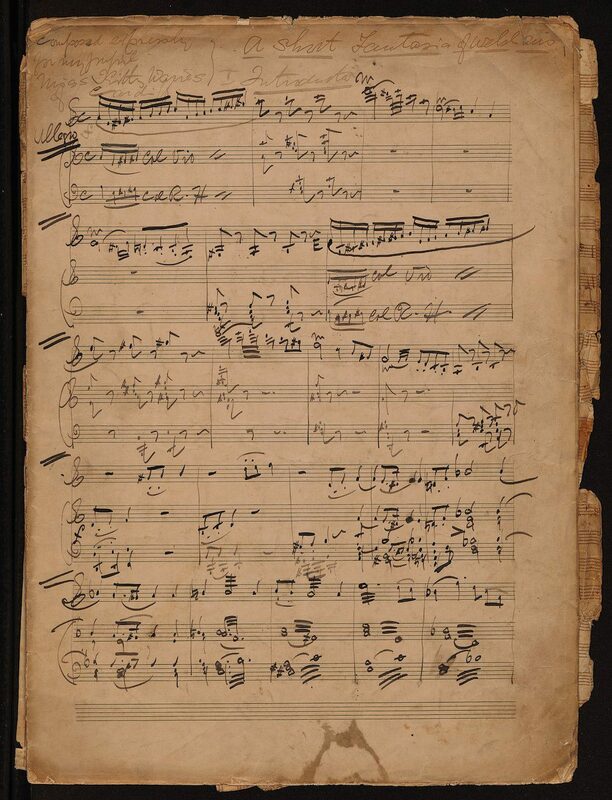 The beginnings of a piano accompaniment to this piece can be seen in the manuscript although it disappears after a couple of pages. 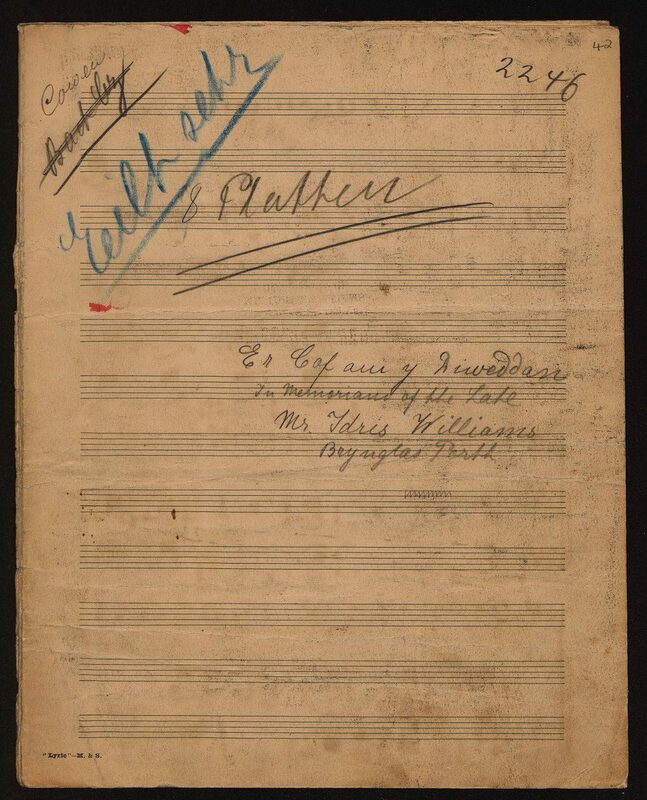 Noted at the top of the score by Parry himself (as a help to any non-Welsh performers of his music) is a short description of who Dwynwen was: “the smile of bliss, the Venus of the Britons; a woman’s name, the daughter of Brychan Brycheiniog”. This work of Parry’s, written while a resident of Penarth is dedicated to the Liberal politician and local councilor, Idris Williams who had recently died suddenly at the Congregational Chapel in Porth, South Wales in 1894. 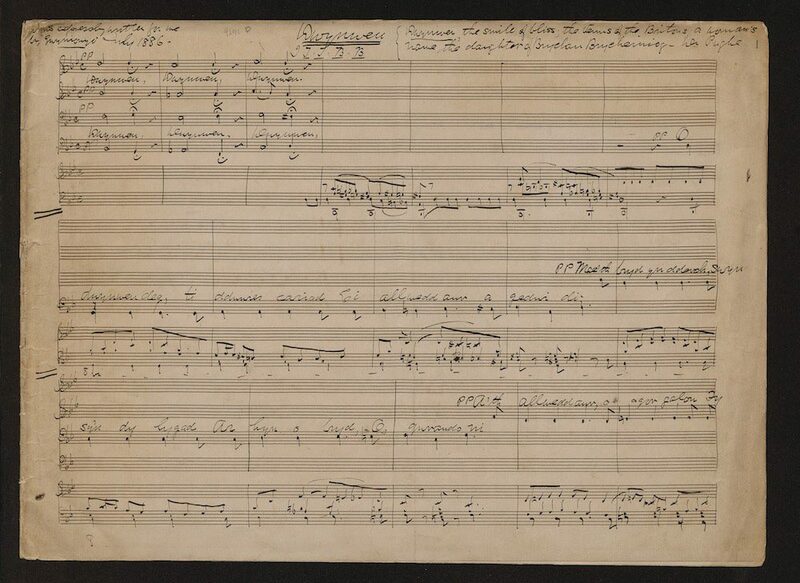 The piece is set in a dolorous minor key and the inclusion of four solo passages as an introduction elevates the ambition of such a short work, almost suggesting a miniature requiem. It is effective, nevertheless at concisely conveying the sadness and darkness immediately following a loss. Originally performed at a memorial service for Idris Williams, it ends optimistically with a chorale (‘Haydn’) which would have been performed by the congregation. Fitting well into Parry’s already burgeoning canon of songs is this unpublished work – Two Christmas Eves – written at an unknown date with words by longtime collaborator, Professor Rowlands of Brecon College. It is typical of his song-writing style and similar in vein to other songs of his such as Hoff Wlad fy Nghenedigaeth. 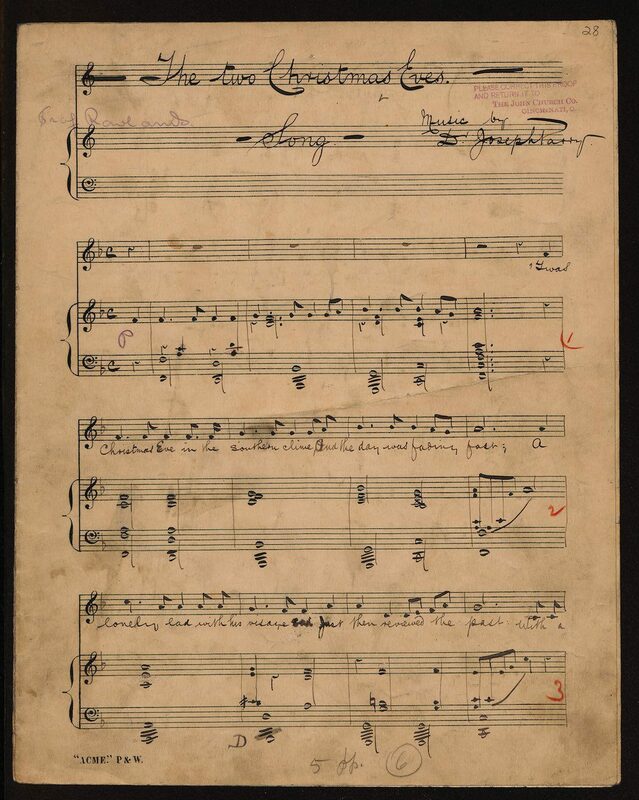 The song grows from a modest beginning into a classic nineteenth-century song finale, complete with grandiose repeated-triplet chordal accompaniment. This one, however, has a lighter, festive quality which would make it a perfect (and hitherto unknown) Christmas classic!